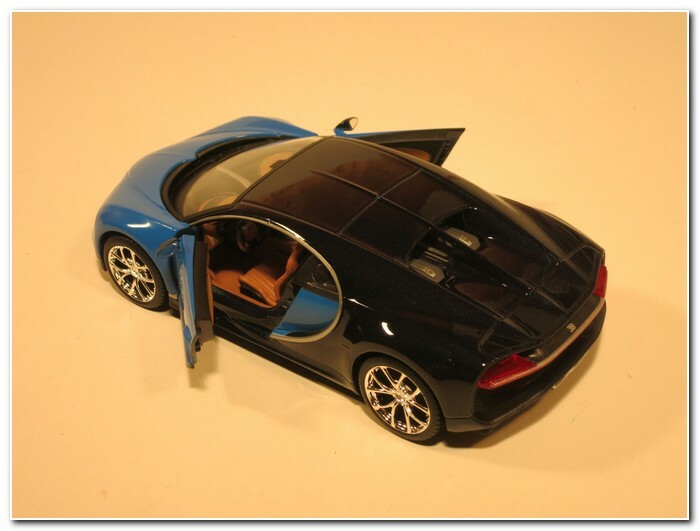 Photographs and illustrations of some of the models discussed in this article taken by the Author may be found at the end of the article. 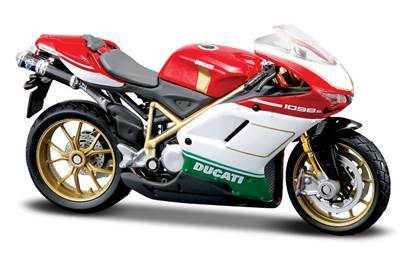 Ducati began producing radio parts in 1922 followed by cameras and electric razors. After the Second World War Ducati acquired Siata to produce clip-on motors for cycles and in 1952 launched the Cruiser scooter. 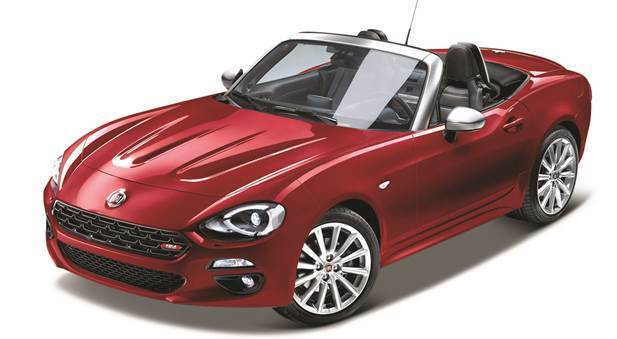 Years before its time it featured a 175cc ohv four stroke motor with a 12 volt electric starter, automatic transmission and styling by Ghia. 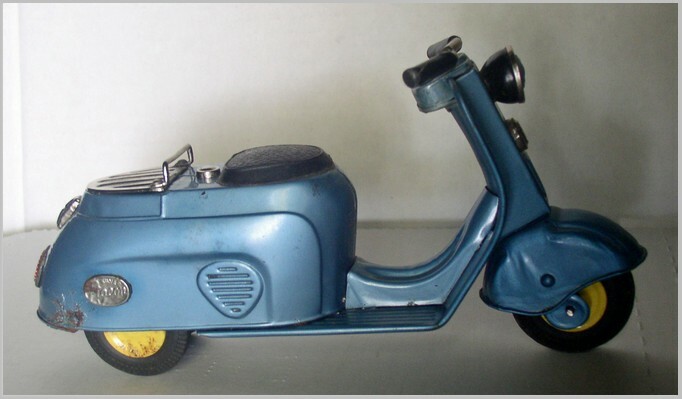 Far too sophisticated for the period it died after just two years but another attempt came with the totally basic Brio 48 in 1964 with a 94cc 2 stroke motor followed by the Brio 50 and 100/25 between 1968/9. A very nice model of the Cruiser is available sold as Altaya but made by Ixo no doubt in conjunction with a part-work. 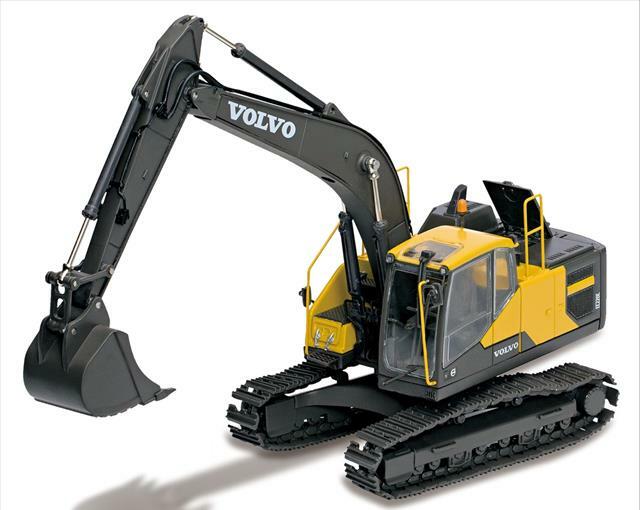 Of mainly diecast construction it features plastic side panels and working steering. 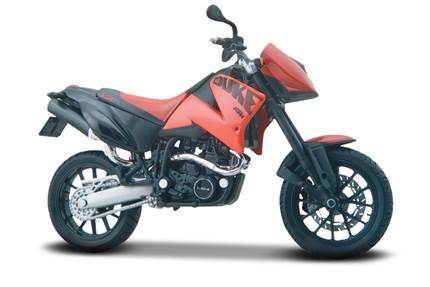 Makers of German aircraft since 1922 Heinkel were limited to three and two wheeled vehicle production after the Second World War. 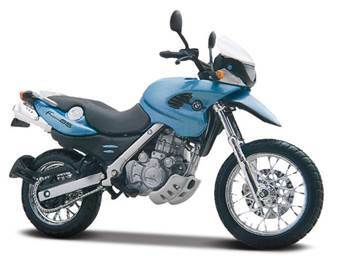 Their 150cc Tourist 101 was made from 1953-54 and featured a four stroke engine. This model was replaced by the 175cc 102 in 1954 while a Mk11 version with more streamlined rear bodywork was made from 1962-67. 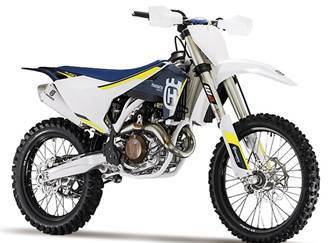 A smaller two stroke machine, the 112 featured a 125cc engine in 1960 but was enlarged to 150 in 1961 for continued production until 1967. 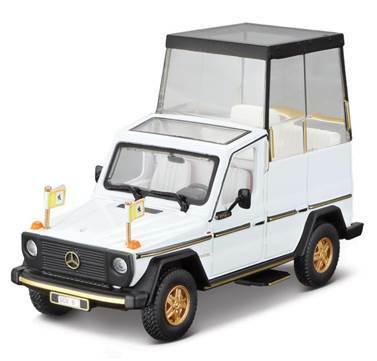 Schuco produced some superb 1:10 scale diecast models of the Mk11 Tourist in a variety of versions as well as smaller versions in their Piccolo range. 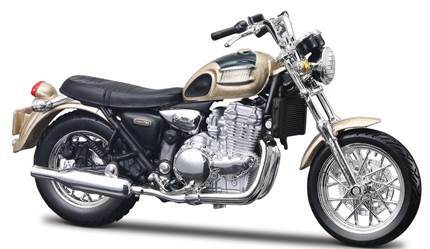 The Czech firm of Janacek made the German Wanderer motor cycle under licence and when they merged with the Czech Arms Works who had made motor cycles since 1932, the name Jawa was created. 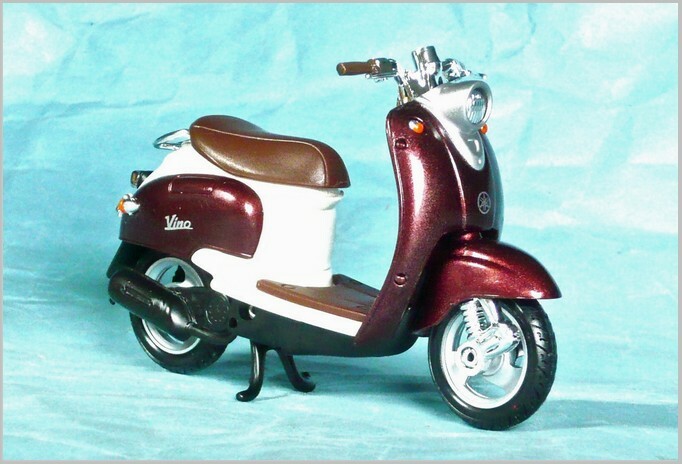 Their distinctive 501 scooter made from 1957-64 featured a pointed nose that accommodated the fuel tank and the headlamp. A subsequent model the 502 had more power with a 175 engine and the headlight was later moved onto the apron being replaced in the nose by the horn. In 2017 an electric powered scooter, the 507, featured the same styling and is to be built in limited numbers in China. A smaller engined and less eye-catching scooter, the Manet appeared in 1958 and featured a 98cc motor and became the Tatran with 125 motor in 1965. A flywheel powered plastic toy Cezeta captured the recognisable styling very well and carries the CH logo as its only means of identification. The French Motobecane company made motor cycles from 1923, the post war Mobylette being among their most popular products. 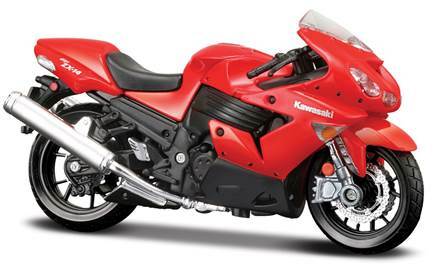 In 1984 the Japanese Yamaha company became its parent company and the name became MBK. 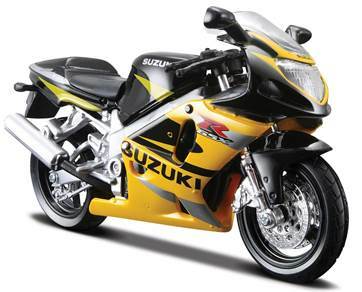 Among the contemporary Japanese parent companies products was the Zuma scooter and MBK gave it the name Booster and the French factory have produced these in large numbers in 50 and 125cc versions. 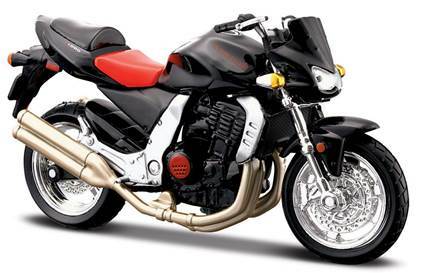 Appropriately Majorette, possibly in conjunction with Hatchette, have produced a model of the French version of this machine, said to be a 1995 50cc example. 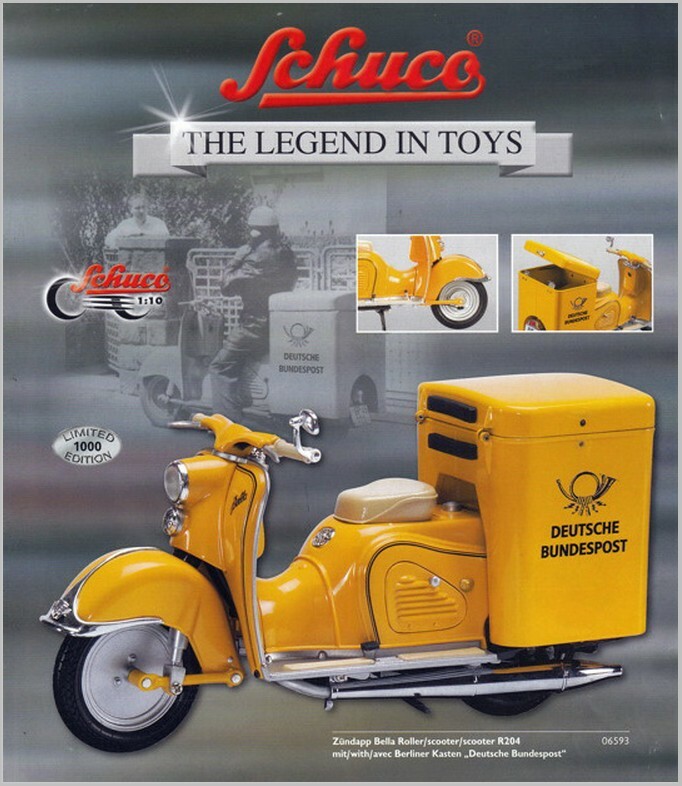 This Italian company began in 1930 producing pedal cycles but like many moved into mopeds and scooters in the post war period. 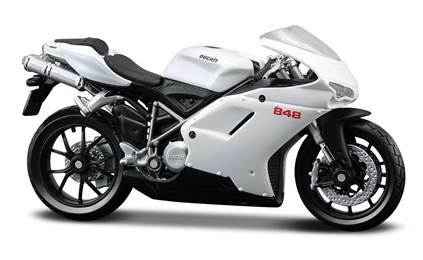 A myriad of different scooters were produced but the Phantom F12 appeared in 1997. 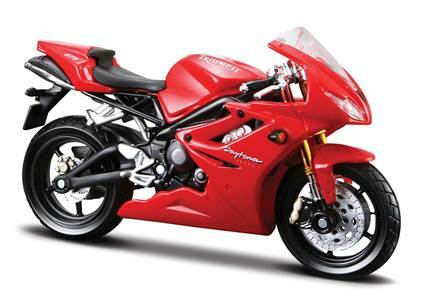 The F12 Phantom had a 50cc motor and was water cooled, production lasting until 2003. 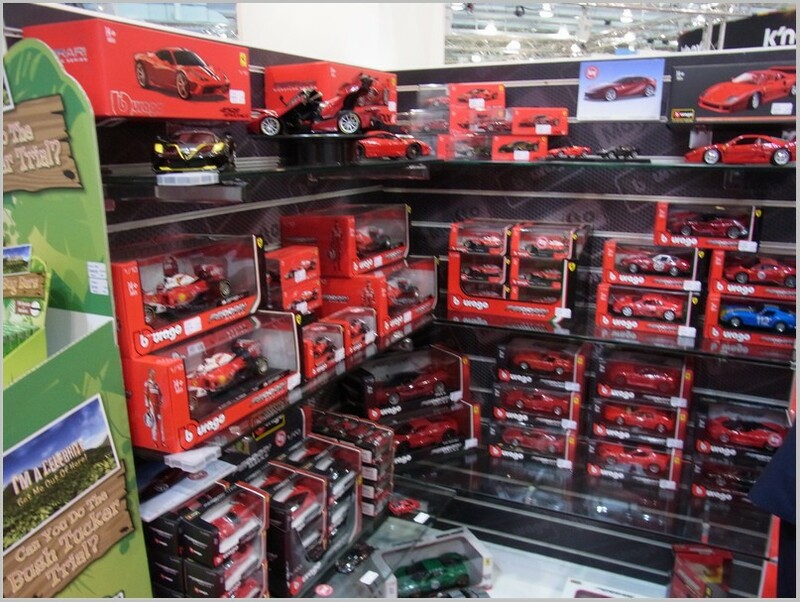 Maisto produced a 1:18 scale diecast model of the F12 Phantom and it comes complete with “liquid cooled” stickers that are barely legible. Mitsubishi began as a shipping company in 1870 and from 1881 developed into a huge conglomerate embracing first coal mining, then steel producing, shipbuilding, insurance and eventually producing anything and everything imaginable. From 1921 aircraft were produced and in common with some other Japanese operations they enforced slave labour during the Second World War. Motor scooter production began in 1946 with the 112cc C10 Silver Pigeon while at least seventeen further developments of the Silver Pigeon scooter were made up to the early 1960s, taking 45% of the Japanese scooter market. 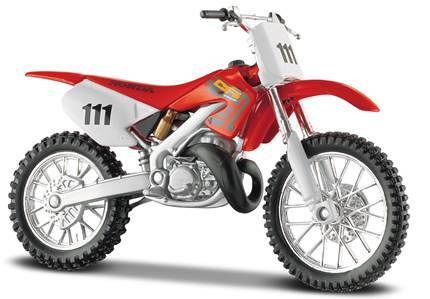 The C110 Silver Pigeon was a 175cc 4 stroke machine with automatic transmission made between 1960/61 and some tinplate toys of which were made by both Marusan and Bandai. The German Simson brothers got into the gun and gun barrel producing business in 1856 and by 1896 were making bicycles. Although firearms continued to be their principle products cars were made from 1907 to 1934 – with the inevitable wartime gap. 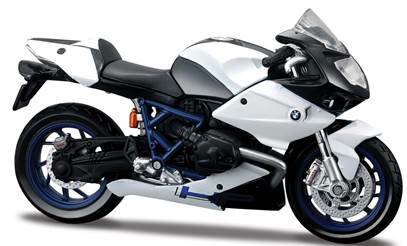 As the Simson family were Jewish, the German Third Reich seized their factory in 1936 renaming the operation BSW. 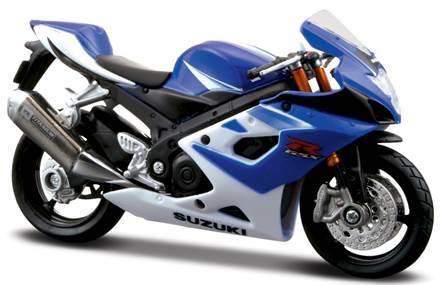 Following the Second World War the factory ended up in the German Democratic Republic and began producing 4 stroke motor cycles in 1949. 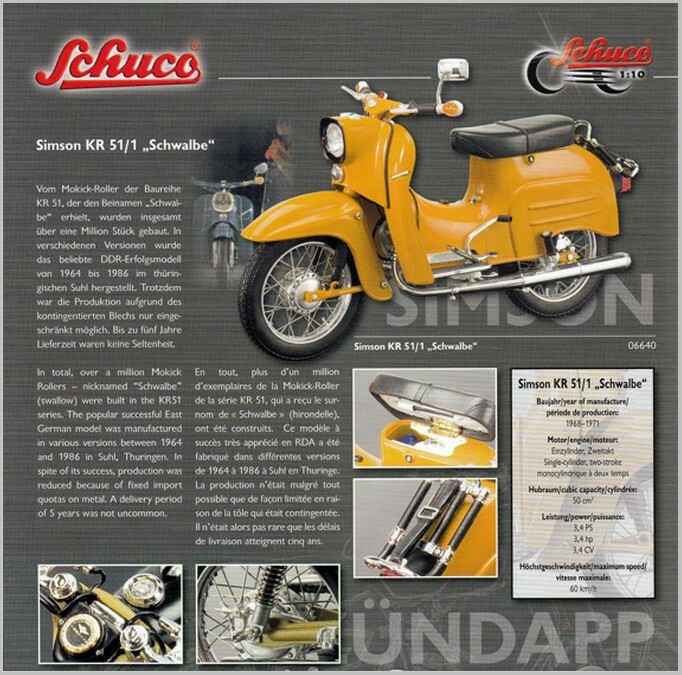 In 1955 the Simson name was restored and the production of two stroke mopeds began developing into the KR51 Simson Schwalbe (Swallow) scooter in 1964. 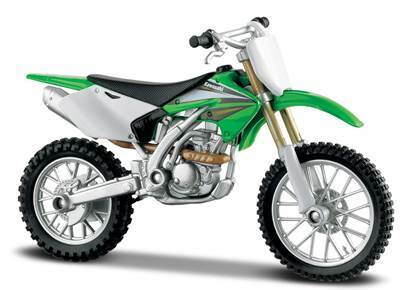 This featured a 50cc motor and large 16” wheels and with an increase in power output became the KR51/1 in 1968. 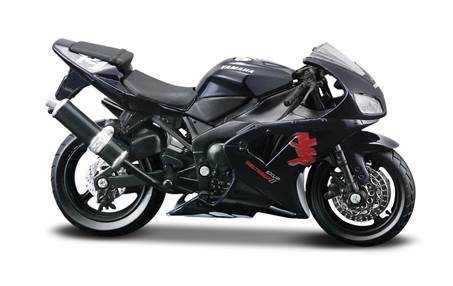 The subsequent KR 51/2 remained in production until 1986 and the Schwalbe has become quite collectable in Germany. 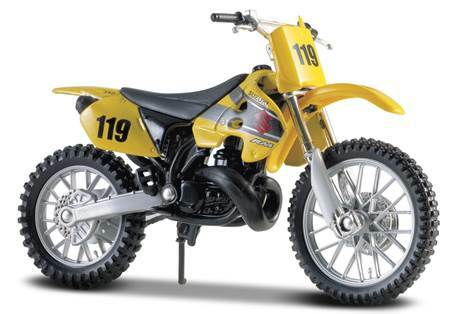 A 1:10 diecast Simson KR 51/1 Schwalbe was produced by Schuco in 2006 while a much smaller 1:87 model of the same subject has been made by Herpa. This Japanese company began by producing loom machines in 1909 but was trying to expand its product base by experimenting with a prototype light car prior to the Second World War. 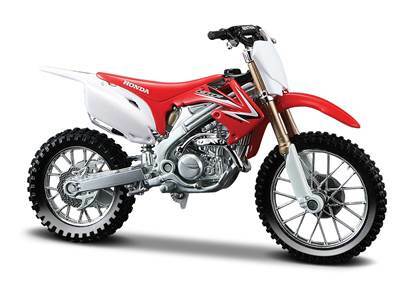 Following the hostilities production of 36cc powered cycles began in 1952, motor cycles in 1954 and cars a year later. 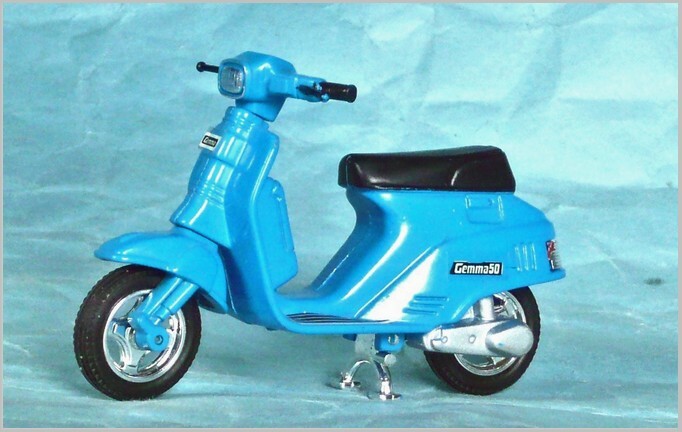 In the early 1980s their first scooters appeared with the CS50, 80 and 125, called Gemma in Asia, Roadie in the UK and Puch Lido in Europe. 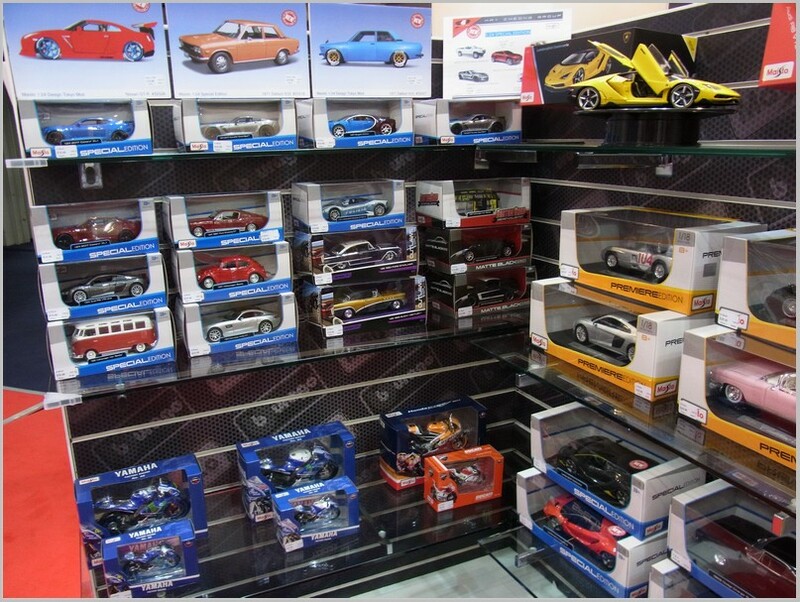 A 1:28 scale diecast Gemma 50 was made by Tomy, a slightly larger 1:24 scale diecast of the same subject from Tamiya and kits in 1:12 scale from Aoshima/Imai. Yamaha began producing pianos and reed organs in 1887 and ultimately became the largest manufacturers of musical instruments in the world. 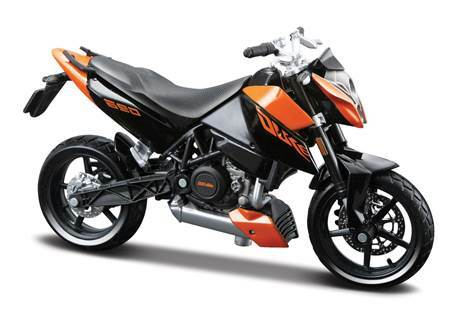 They first produced motor cycles is 1954 with their 125cc two stroke Dragonfly, that was based on the German DKW RT 125, as was the BSA Bantam. 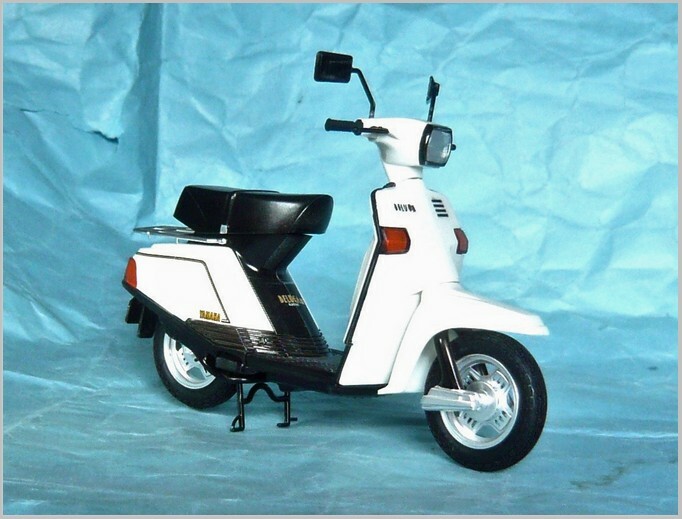 Their first of many scooters came in 1981 with the 50cc Salient and 80cc Beluga, Riva in the US and Hercules in Europe. 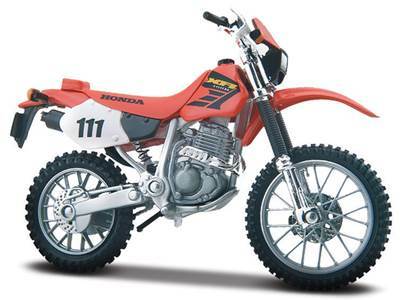 In 1985 a 125cc version was added. 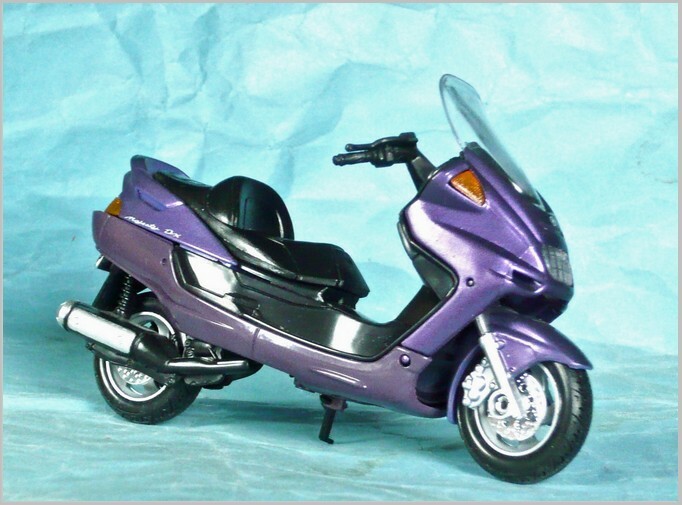 The Zuma scooter came in 1989 and this was also made in France by MBK. 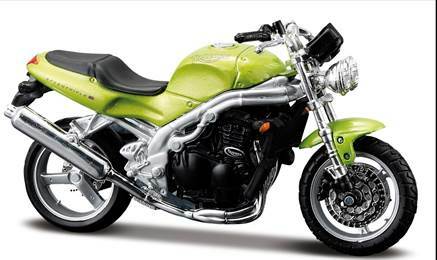 In an effort to modernise their range of scooters Yamaha produced the YJ 50 Vino in 2001 which continued until updated into the XC50 in 2006. 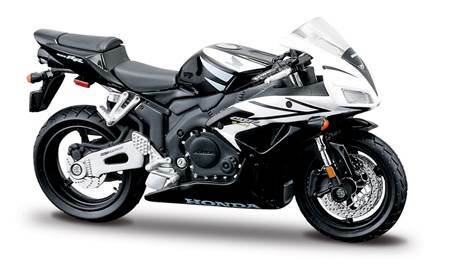 Production of this continues today while the 125cc version lasted from 2004-10. 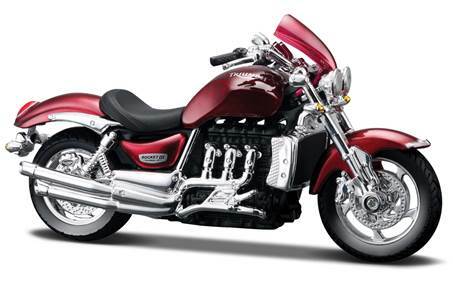 The Yamaha Majesty was a large machine appearing in 2001 and was produced in 125, 250 and 400cc sizes. 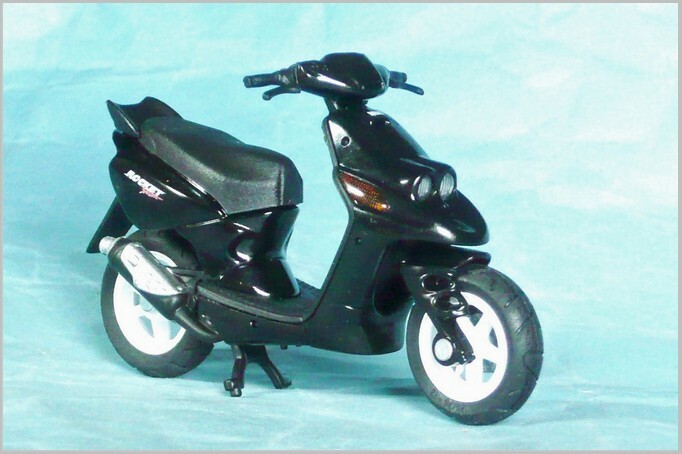 In model form Yamaha scooters have been produced in various sizes and materials. 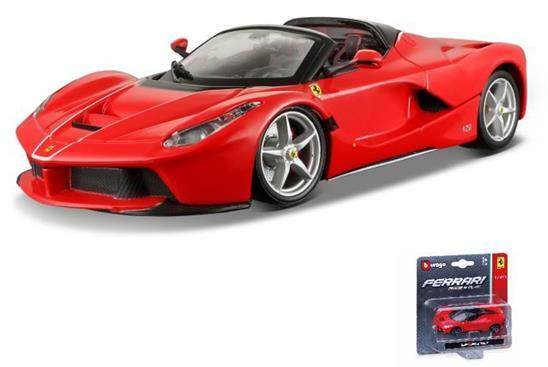 Plastic kits for the Beluga came from Aoshima/Imai in 1:12 scale and Otaki in 1:16 scale, while a diecast 1:24 scale version came from Tomica. 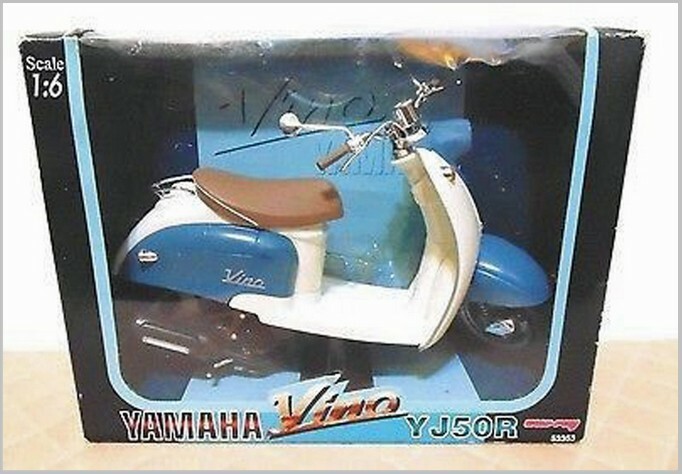 A diecast/plastic 1:18 scale Vino YJ50R came from Welly, a diecast 1:6 scale version of the same was done by New Ray while the big Majesty DX 400 also came in 1:18 scale from Welly. 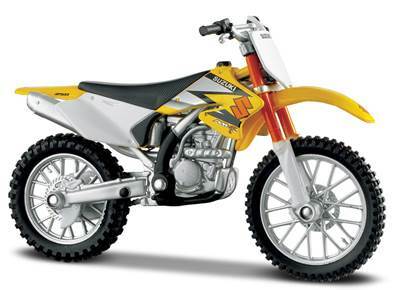 This German company began by producing detonators in 1917 but as the demand for weapons parts declined after the war motor cycle manufacture began in 1921. Following the Second World War microcar, moped and scooter production was undertaken and inspired by the Parilia Greyhound, the Zundapp Bella scooter appeared in 1953. 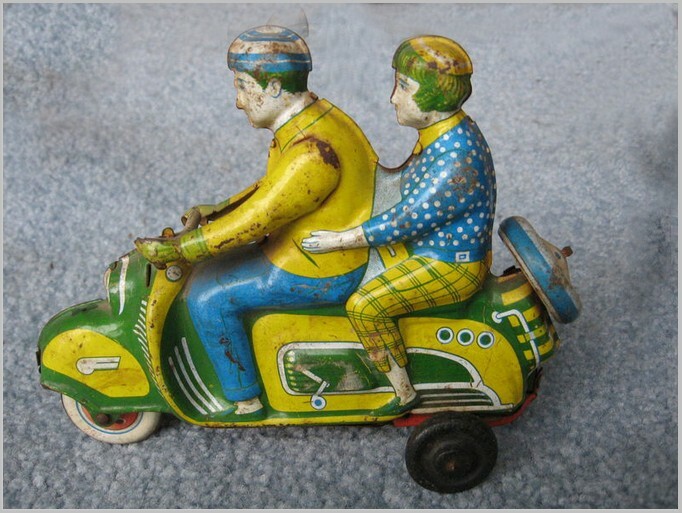 These became generally regarded as among the best scooters in the world at the time and through various updates continued in both 150 and 200 versions until 1964. 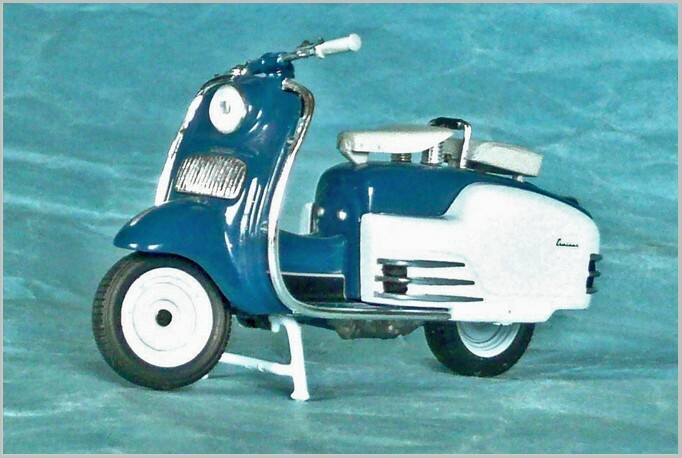 An attempt to get into the small scooter market was launched in 1964 with the Roller 50 that was based on the contemporary Lambretta Slimline. 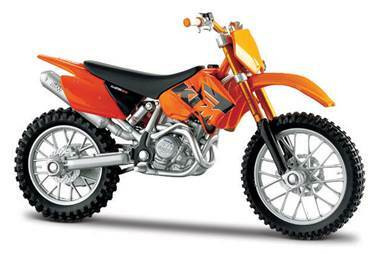 The company closed in 1985 and the factory and stock were moved to China. 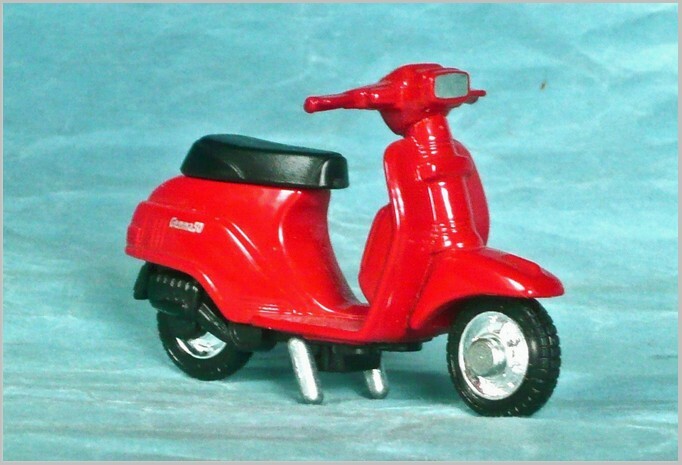 As a final section there has been a few toys of scooters that so far have not been identified, in fact they are probably not meant to depict any particular example. 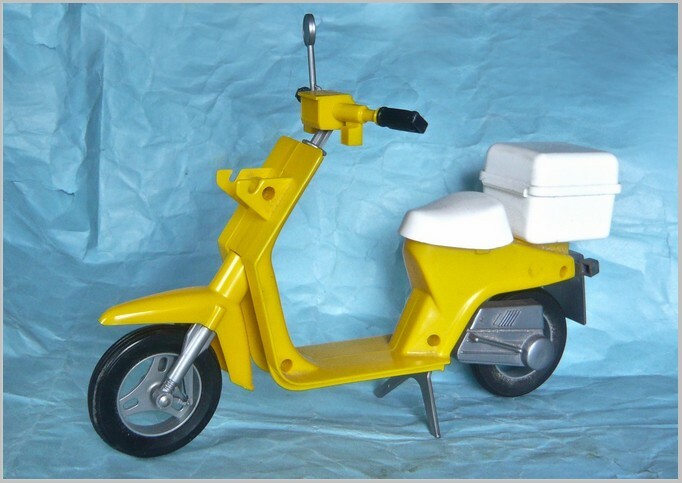 A quite imaginatively styled plastic battery driven toy called Chalmy Rider came from WS in Hong Kong and carries the number 6623 under its base. 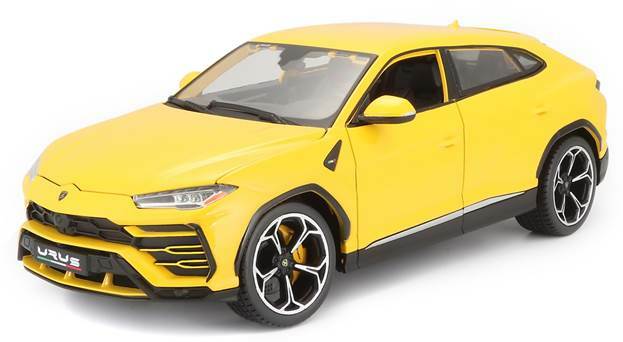 The seat tips revealing space that accommodates a couple of AA batteries, the fitting of which drives the twin rear wheels and illuminated an orange headlight. 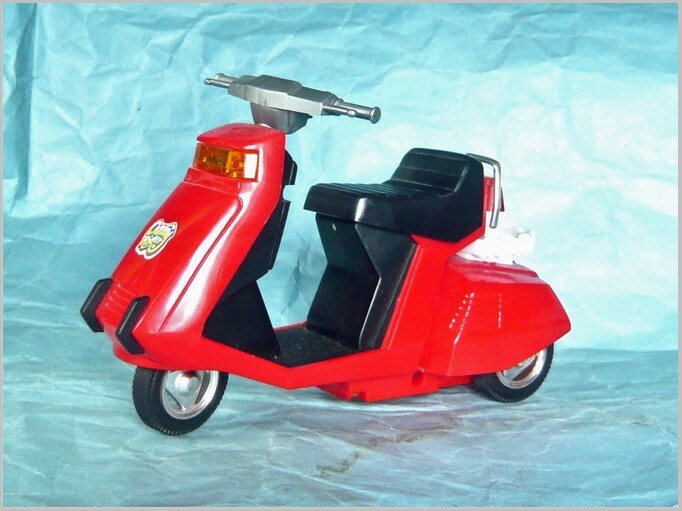 An extremely slim plastic toy scooter that vaguely resembles something like the Triumph Tina carries no markings at all and probably came as an accessory to a Barbie type toy. 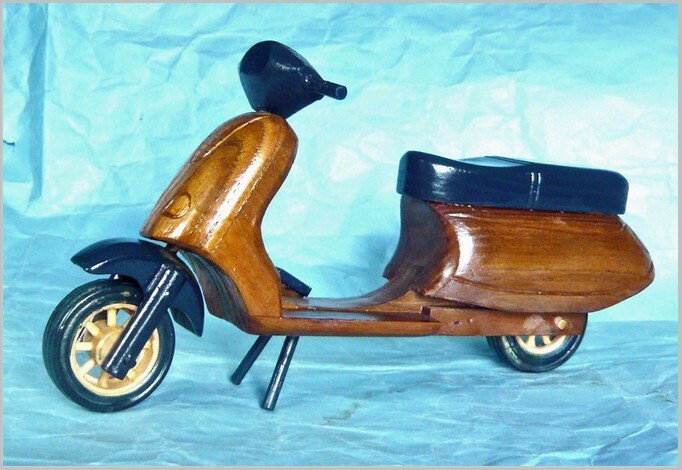 An all wood crafted toy has a suggestion of machine made parts that have been glued together but carries a barcode under its base. 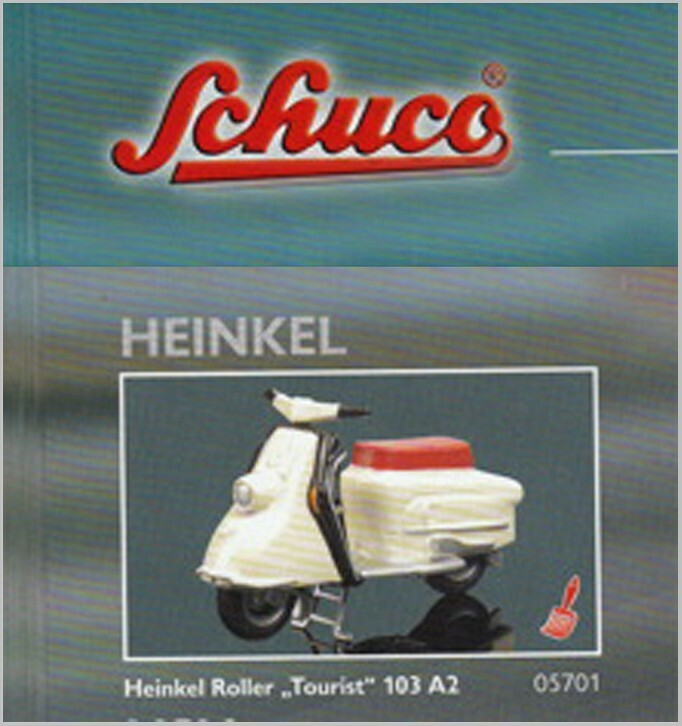 Schuco 1:10 diecast kit : 06537, 1960 Heinkel 103 A2 Tourist. 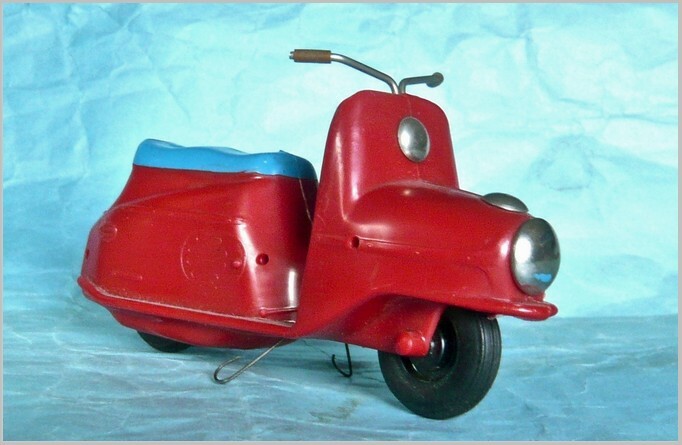 Schuco Piccolo diecast : 05701, 1960 Heinkel 103 A2 Tourist. CH plastic flywheel driven : 1957 Jawa Cezeta 501. Maisto 1:18 diecast/plastic from China : 1987 Malaguti Phantom F12. 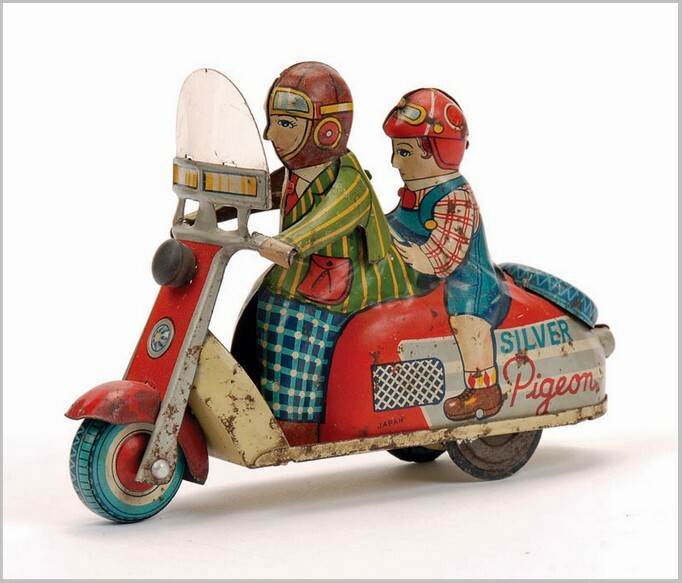 Marusan tinplate from Japan : 1960 Mitsubishi Silver Pigeon C110. Bandai tinplate from Japan: 1960 Mitsubishi Silver Pigeon C110. 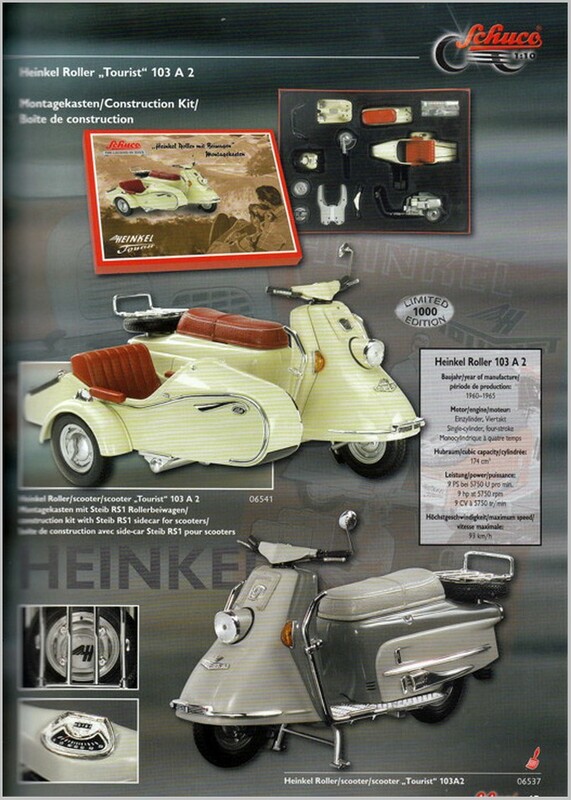 Schuco 1:10 diecast kit : 06640, 1968 Simson KR 51/1 Schwalbe. 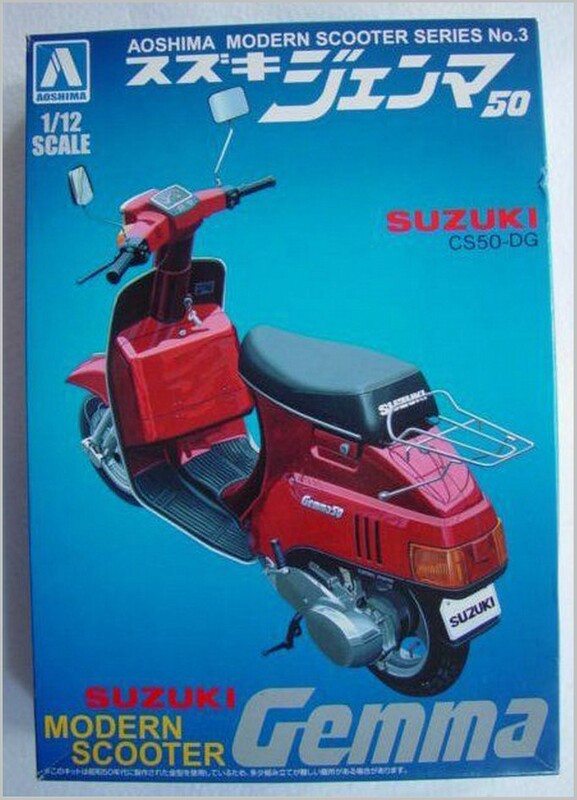 Tomy 1:28 diecast from Japan: 49, 1982 Suzuki Gemma 50. 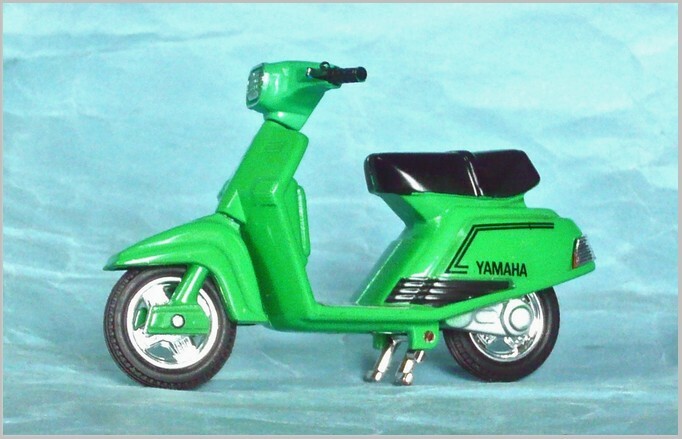 Aoshima 1:12 plastic kit from Japan: 1981 Yamaha Beluga. Tomica 1:24 diecast from Japan: 1981 Yamaha Beluga. 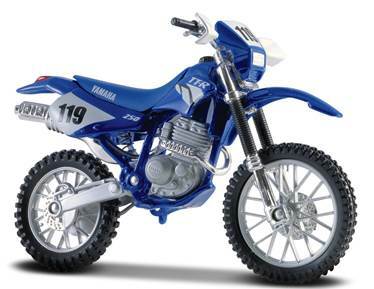 Welly 1:18 diecast/plastic from China: 2001 Yamaha Vino YJ50R. 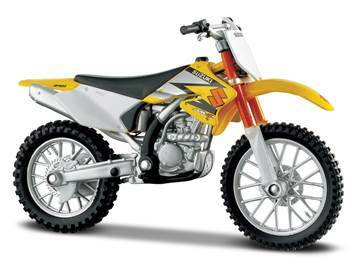 New Ray 1:6 from China: 2001 Yamaha Vino YJ50R. 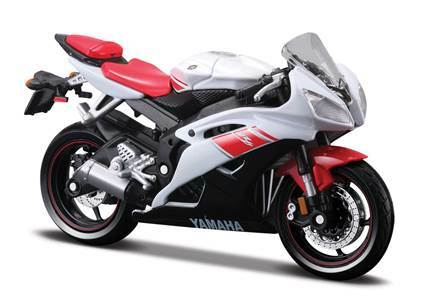 Welly 1:18 diecast/plastic from China: 2005 Yamaha Majesty DX 400. Technofix tin from Japan: 1953 Zundapp Bella. 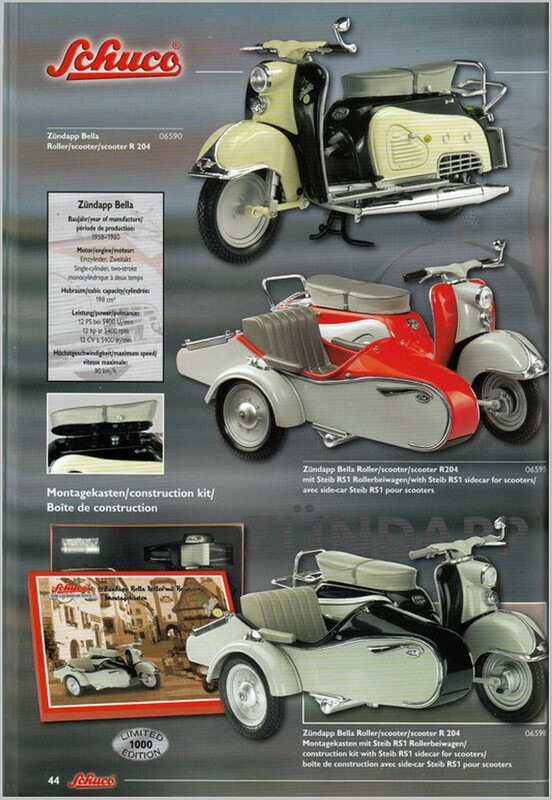 Schuco 1:10 diecast kit: 06590, 1958 Zundapp Bella R204. 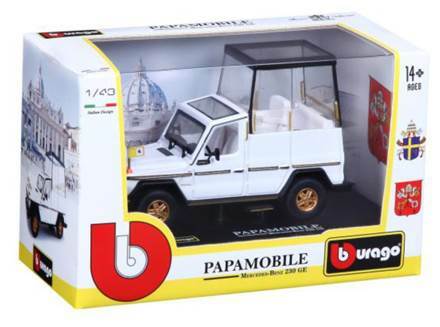 Schuco 1:10 diecast kit: 06593 1958 Zundapp Bella r204 with Deutsche Bundespost box. 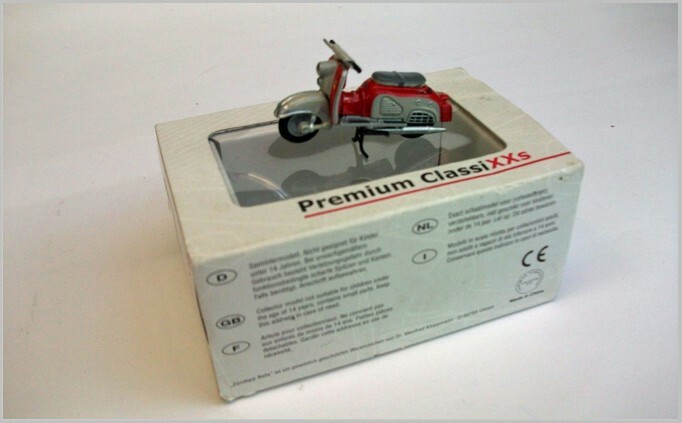 Premium Classix 1:43 : 1957 Zundapp Bella R204. 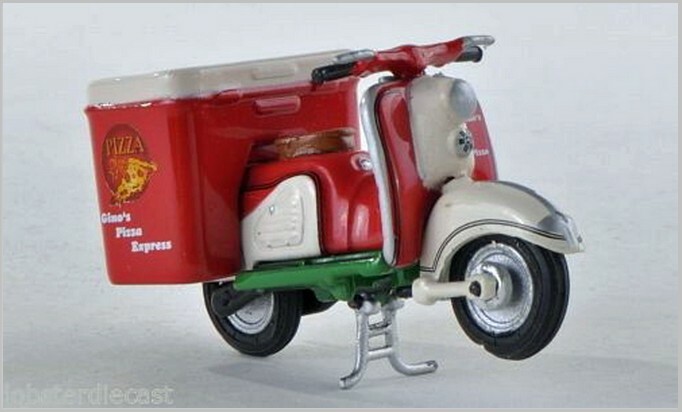 Premium Classix 1:43: 1957 Zundapp Bella R204 with Ginos Pizza box. 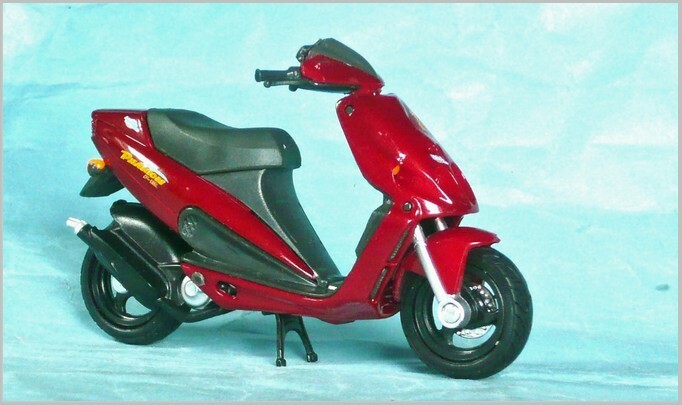 WS plastic battery driven from Hong Kong: Chalmy Rider toy. For more information go to zeteo.com. 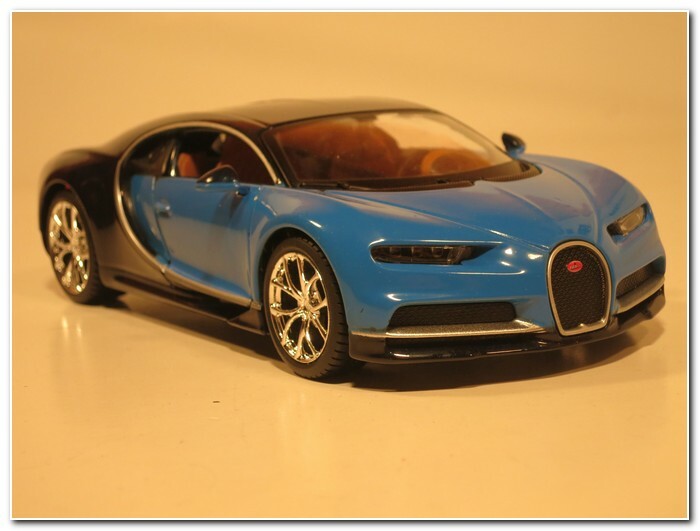 In 2016 Bugatti s.a.s. presented the successor of their Veyron, the Chiron. 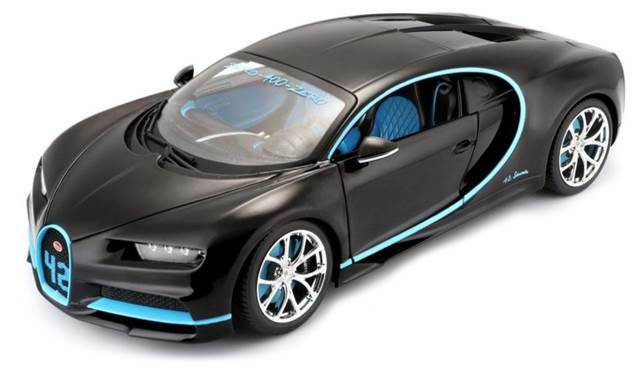 The car was again named after a famous Bugatti racing driver. 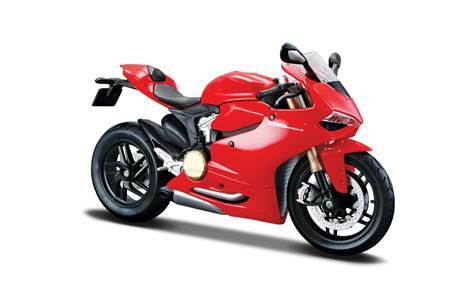 It produces 1500 HP and with no speed limiter fitted it can reach speeds of over 400 KPH (c.250 MPH). 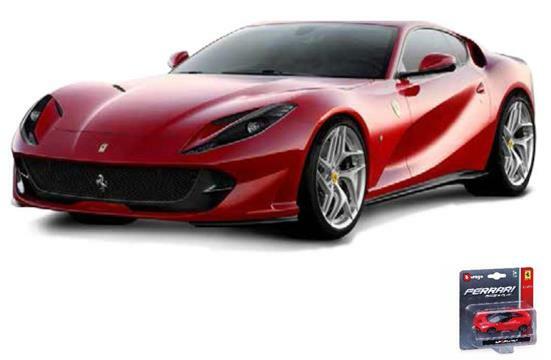 However, this performance is expensive as each car will cost 2.4 Million Euros to buy, a million more than a Veyron! 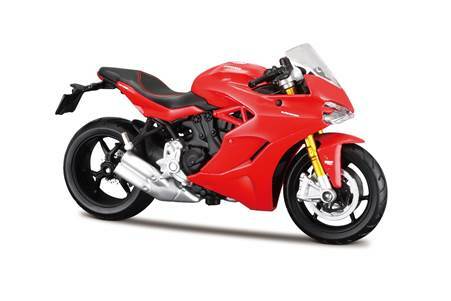 Maisto have produced the model to 1:24 scale. 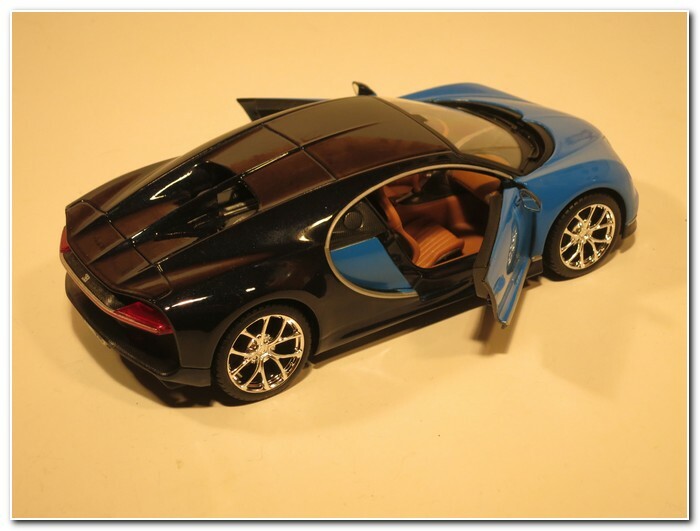 It captures the car’s shape very well and it is painted in two tone blue. 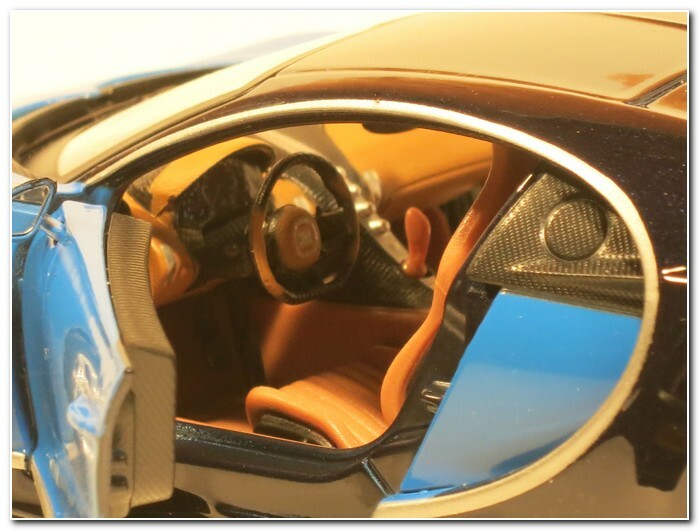 The interior looks accurate and includes a lot of detail. The doors can be opened as shown above. As the photograph above shows the upper part of the engine is visible through the rear windows.